Rubber Pavers and recycled rubber pavers. The rubber paver, from Triton Barns. Horse Stalls and Horse Barns Accessories. Rubber pavers. Recycled rubber pavers. Interlocking rubber pavers. Triton Barns is proud to offer high-quality rubber pavers as the ideal horse stall flooringsolution for your horse barn. They’re available in terra cotta, forest green, slate gray, and black, giving your barn the ultimate attractive flooring. 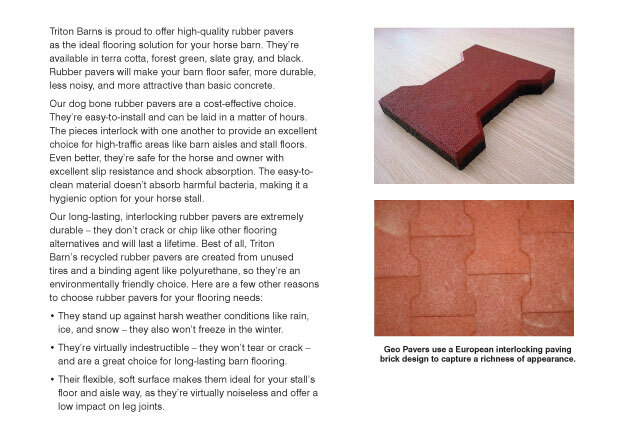 Our dog bone rubber pavers are a cost-effective choice. They’re easy-to-install and can be done in a matter of hours. The 7/8” – 1 ¾” thick pieces interlock with one another to provide an excellent choice for high-traffic areas like your barn’s aisle and stall floor. Even better, they’re safe for both the horse and the owner, with excellent slip resistance and shock absorption. The easy-to-clean material doesn’t absorb harmful bacteria, making it a safe and hygienic option for your horse stall. Triton Barn’s long-lasting interlocking rubber pavers are extremely durable – they don’t crack or chip like other flooring alternatives, and will last a lifetime. Best of all, Triton Barn’s recycled rubber pavers are created from unused tires and a binding agent like polyurethane, so they’re an environmentally friendly choice. They stand up against harsh weather conditions like rain, ice and snow – and, they won’t freeze in the winter. They’re virtually indestructible – they won’t tear or crack, so are a great choice for long-lasting barn flooring. Their flexible, soft surface makes them ideal for your stall’s floor and aisle way, as they’re virtually noiseless and offer a low impact on leg joints. Contact us at (800) 918-6765 for more information about Triton Barns Rubber Pavers.